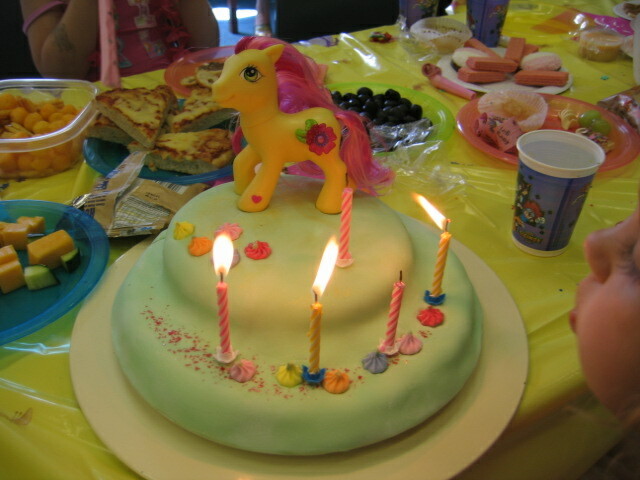 My little pony cake - mid-blow. Esmes party has been and gone. thats me done with all my kids parties for another year. Oh, my little pony! That brings back childhood memories...my little sister, Katie, LOVED the My Little Ponies. Isn't it funny how all the things we loved as kids are back again? It looks like Esme's party was a big hit! My daughter loved the birthday cake although she feels she is much too old for My Little Pony. Well done. Heavens ,I couldn't agree more about the Birthday party thing ,but they are such fun to plan and our sweet children will always look back with precious memories! the cake looked great. If I had had a girl... she would have been swamped with little ponies stuff. Anything to keep her off Barbies for as long as possible. Your cake looks great. How do you do the icing so smooth? Mine always looks bumpy.